Shamrock Shake – everyone is familiar with this St Patrick’s Day treat from the golden arches. Since I no longer eat refined sugar or dairy, I wanted to come up with a treat that I could feel good about sharing with my little leprechauns. 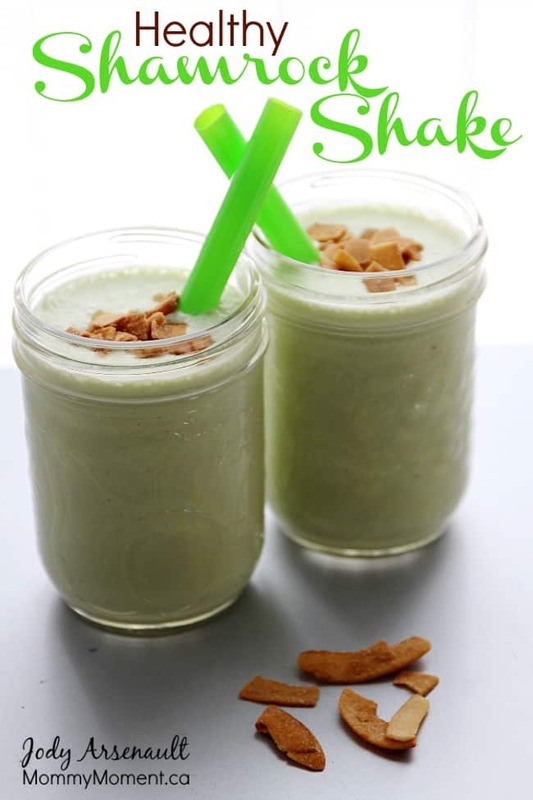 This shamrock shake is a healthy version of the well loved, not-so-healthy version that is popular around St Patrick’s day. This shamrock shake is Paleo, dairy-free and refined sugar free. Put all the ingredients together in a blender (I use a Vitamix) till smooth, pour into little mason jars, add some cute straws and you are ready for a healthy St Patrick’s Day treat. * I use doTerra peppermint essential oil. The addition of mint to my smoothies is something I have yet to try! Sounds delicious! Hey this does sound tasty! That Shamrock Shake looks Absolutely Tasty – do I have to wait until St. Patrick’s Daay? interesting take on the shamrock shake. I am the only one in my family who likes mint flavour though. Yummm, looks very tasty, would this work using Kale instead of spinach? i am going to try this recipe i know my grandchildren are going to love this drink thank you for this recipe i just added it to my book! This sound amazing! I would love this right now.